With our specialised type of photography, called “astrophotography”, we use the light gathering power of our large aperture telescopes in combination with long exposure photography through the telescopes. The long exposures reveal the magnificent colours and faint details of galaxies, gaseous nebula and star clusters that we could otherwise never see with our eyes alone. 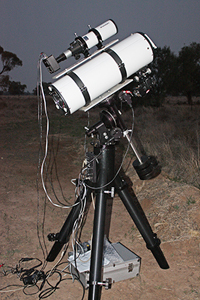 Our specialised thermo-electrically cooled camera attached to the telescope holds its shutter open for extended periods of time to produce exposures that are many hours long. During these very long exposure times all the light that is collected by the telescope is accumulated onto the camera image sensor and the image grows brighter over time. Many of our exposures are up to 6 hours long, and some even longer. All going well, at the end of the very long exposure photograph the distant faint celestial object is revealed in its full colour and detail. Astrophotography is an extreme type of photography that offers many complications, after all we are trying to photograph objects that slowly move across the night sky, and they are usually thousands or millions of light years away from Earth making these celestial objects extremely faint. 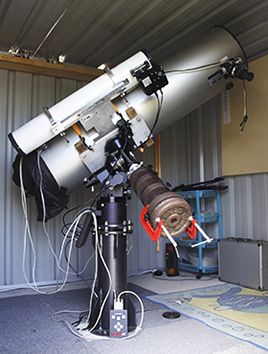 Our precision servo motor driven telescope mount is used to accurately follow the object across the sky and effectively hold the deep sky object perfectly still for the entire duration of each long exposure photograph. Adding to the complexities of astrophotography the skies need to be very dark and not brightened by city lights or the Moon, which makes the night sky too bright for deep space astro-photography. Not only does the sky need to be very dark, it also must be free from clouds that might drift through the long exposure photograph, as does the occasional aircraft or Earth orbiting satellite. Focusing the camera on faint or barely visible celestial objects also requires special techniques to obtain perfect focus. It’s not much fun spending the entire night photographing only to find after several hours of exposure time the camera wasn't focused properly! 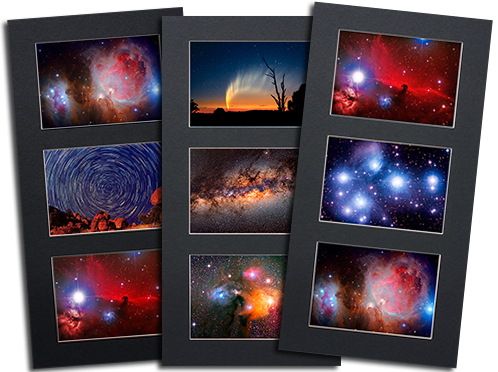 This is a brief insight into the art and science of telescope based astrophotography... photographing our distant neighbours in the universe in their true colours and detail for all to see, enjoy, and ponder.